Cnoc na Toinne is an often overlooked saddle shaped peak nestling among giants of 900m+; nonetheless, at 845m it is higher than many more noted tops, including Mangerton, Nephin and Mweelrea. 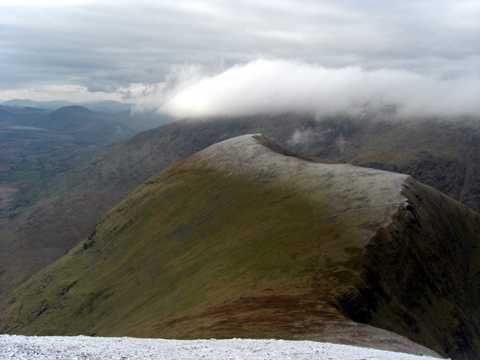 Given its position, it is rarely climbed by itself, but more usually as part of a traverse of the Reeks Ridge, in either direction. From the more usual, east to west direction, it is the last peak before the descent towards the top of the Devil's Ladder and the climb to Carrauntoohil.